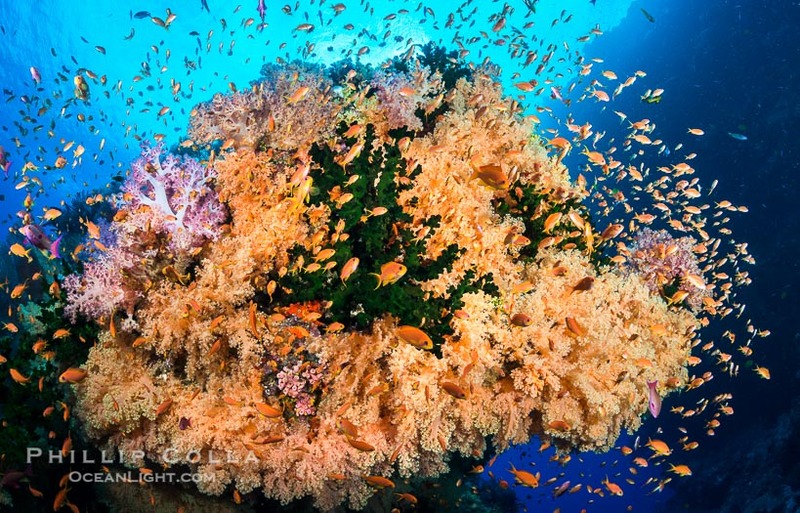 Fiji’s Coral Reefs are known as the “Soft Coral Capital of the World” for good reason. Spectacular displays of colorful soft coral, usually Dendronepthya, are found on Fiji’s coral reefs in abundance. I had done a fair bit of research before the trip and thought I knew what types of soft coral I would see, and how I wanted to photograph them. However, one type of soft coral that escaped my attention before I got to Fiji was Chironephthya. 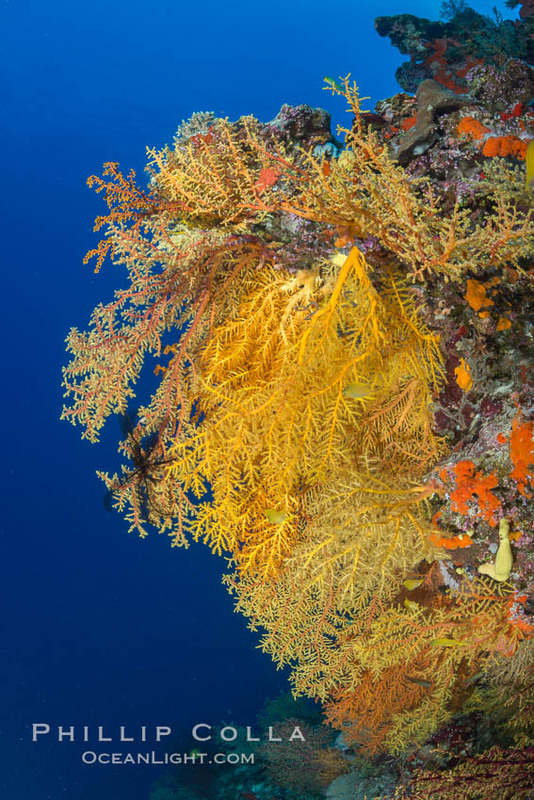 While Dendronephthya tends to inflate and “stand up” off the reef, with fat cylindrical branches, Chironephthya on the other hand more often “hangs down” and, at first glance, looks similar to some of the gorgonians and sea fans I have seen in temperate water albeit with more intense color. From “species-identification.org”: Colonies heavely branched, resembling gorgonians. Polyps scattered on stalk and main branches as well as at the end of terminal branchlets. Calyces prominent. Stem and main branches almost hollow. Brightly coloured pink, purple, red, yellow, orange. Sclerites are spindles. Zooxanthellae absent. My best looks at Chironephthya were at the dive spot Mount Mutiny, a lone coral bommie in the current-laden Bligh Waters, with vast sheer walls perfect for soft corals to thrive. 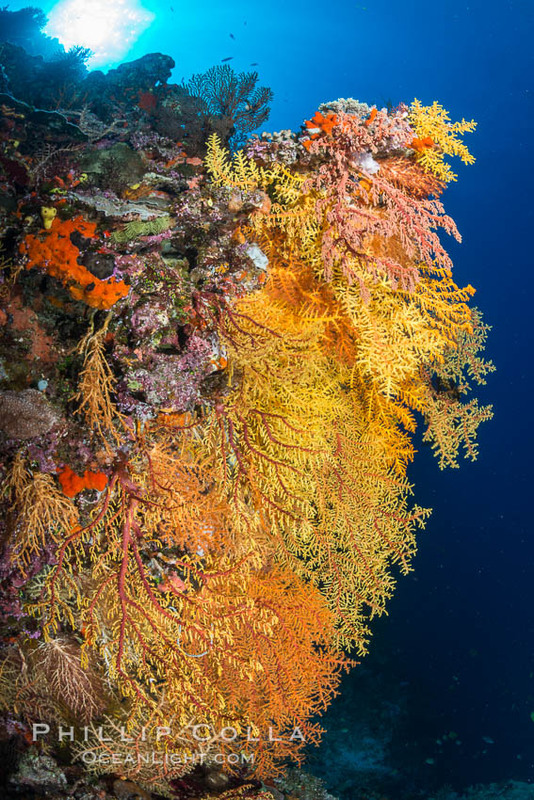 I made several dives at Mount Mutiny, each time passing along the spectacular Rainbow Wall section, a huge wall replete with dense swaths of Chironephthya color, particularly underneath overhangs. I hope to return in the next few years and photograph it with some macro gear. All of my Fiji coral reef images are available for publication and as high quality metal, canvas or photographic prints. Cheers, and thanks for looking!